I am sending you the penultimate sheet. I am reading again Volume 17 in my morning meditation. I had already read Volume 13 before. The revelations about the Divine Will are sublime! 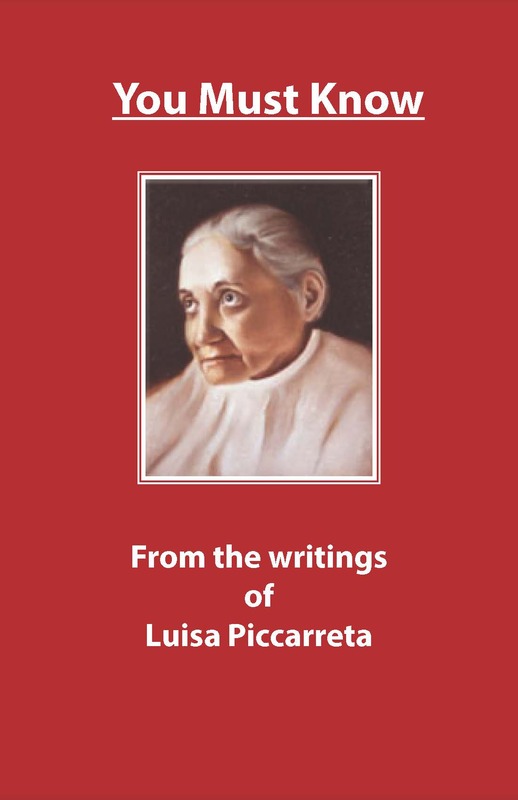 I gave the little handwritten treatise of the lady, your friend, to the ecclesiastical Reviser, and I encountered some difficulties with him over a few points: for example, the words of the consecration which Our Lord repeats over the souls, His Hosts – and other points. I will mortify them quite a bit, and I hope to print all the chapters of the Hours. Someone from a city asked me for 50 copies of the new edition. I hope to come to Trani in the month of June, God willing. I have a case in Palermo which will be decided on June 2nd . I beg you to pray!…We may be losing 70 thousand Lira, unjustly, because of the Masonry! All the arguments are with us! Pray! I kiss the hands of your Confessor. When I come to Corato, if Jesus wants, I have to make several observations to you and to the Confessors regarding certain points of the 12th and 13th books. But the doctrine seems sublime and divine to me! 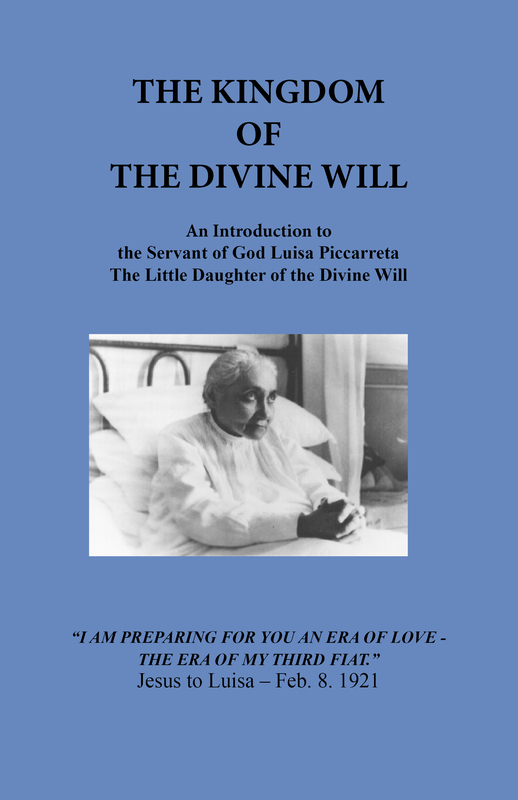 I have commissioned paper for 5 thousand copies of all the treatises on the Divine Will. I may have a beautiful volume printed in our Press of the boys’ House – with our equipment. Prepare for me all the material to be printed. This morning I received a postcard from the renewed Libreria Editrice Pontificia of Rome, asking me for 100 copies of the Hours of the Passion, 4th Edition, with the Treatise on the Divine Will! How did they know? I don’t know! It is the good God who is working. Here, we are hastening the work! Pray! Currently, in my morning meditation, in addition to the adorable Passion of Our Lord Jesus, beloved of our hearts, I meditate – that is, I read slowly and with reflection – two or three chapters of your writings in the Divine Will; and the impressions I draw are intimate and profound! I see a sublime and Divine Science, though I still do not understand it completely, given the scarcity of my intelligence. These are writings that must now be made known to the world. I believe they will produce great good. For as sublime as this science of the Divine Will is, so do these writings of divine dictation present it, clearly and limpidly. In my opinion, no human intellect would have been able to form them. 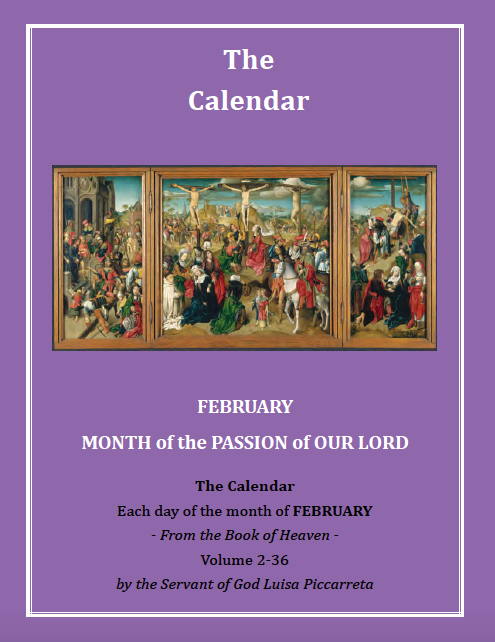 The Hours of the Passion, 4th Edition, is already at the end of the printing, including the little treatise on the Divine Will. However, I am preparing several new chapters chosen from your writings, and I will add them to the Treatise with a little preface. 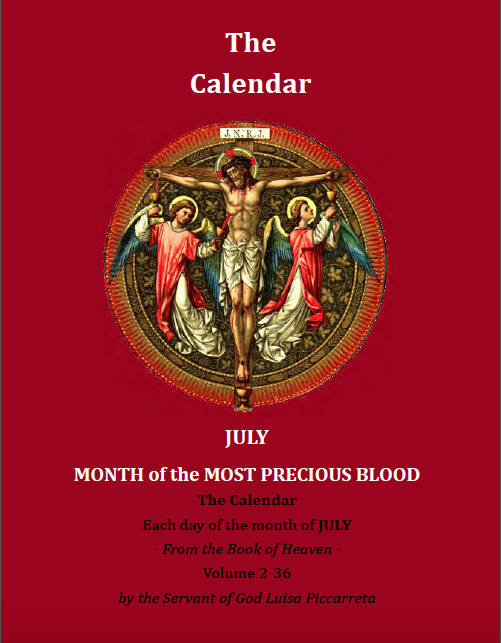 In the meantime I have commissioned new paper for the printing of one entire first volume about the Divine Will, of the size of the Hours; but we will make the choice of the material when I come, God willing, together with your spiritual Father and with you. 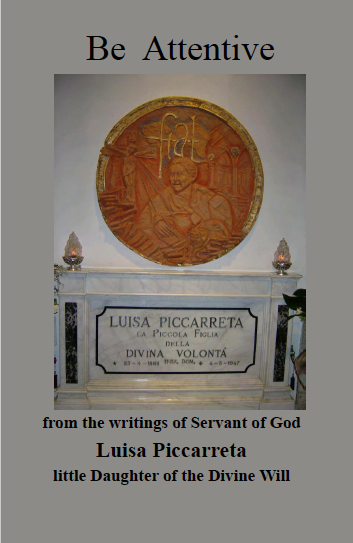 I received a letter from Turin, from a cleric in love with the Divine Will, who is waiting for the new publications. 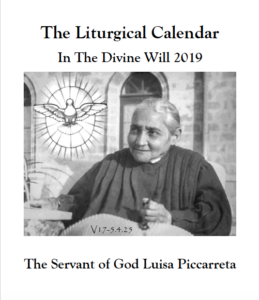 He had written to me three years ago, and he had published in a Catholic periodical some chapters of the Little Treatise of the Divine Will, which is in the Hours. However, I always insist on one point – that is, sanctity does not consist of a formula. In order to form, with this new Science, saints who may surpass those of the past, the new Saints must also have all of the virtues, and in heroic degree, of the ancient Saints – of the Confessors, of the Penitents, of the Martyrs, of the Anachorists, of the Virgins, etc. etc. Now I present to you the most heartfelt wishes for your Name Day. May most beloved Saint Aloysius, whose Name you carry, obtain for you all the fire of Divine Love, and perfect consummation in the Divine Will! I pray you to carry also miserable me, in your flights in the Divine Will! Meanwhile, for you I implore, in my meager prayers, the superabundant grace through which you may correspond perfectly to all the divine designs upon you. Amen. Many regards to your sister. If you change your home, give me your new address. Pray for my coming to the Continent and to Corato, if Jesus wants. I would come by sea. As far as the two copies of the hymns, one is for you and one is for Fr. de Benedictis. 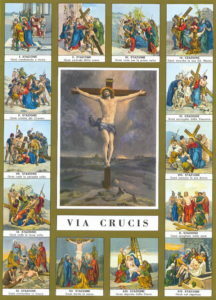 Soon I will send you the little cards of Jesus before the Tribunals, through Manzi; but if you give me the address, I will send them directly, to avoid a double expense. The case was held on the 13th of this month! It took a very good turn. But pray Jesus to enlighten the judges for the sentence. I received several days ago the continuation of Volume 18, sent from Trani. In my unworthy prayers, I supplicate Our Lord for you, that He would not let you suffer so much in these privations, but that He would come back, always and quickly, to comfort you again. I have not been well in my health, nor was I able to leave Messina due to pending businesses. But I hope that Our Lord – if my Fiat is there – may allow me to come to speak with you and with Father Benedetto about the printing. I am pleased that he undertook your direction, and I believe he fixed you up with morning Holy Mass and Communion. I bless you in Jesus Christ. I am reading your writings. They are always sublime revelations – similes worthy of the Divine Creator, as for example that of the beating of the heart compared to the single act of the Fiat! I also bless your dear sister Angelina, the sisters Cimadomo, the nephews and the trainees. P.S. The style and the clarity of your writing, as far as I have read up to now, has improved very much. I received the 4th little volume. I am skimming through the 3rd one and I noticed where it begins to speak about the Divine Will. I read the exaltation of the Cross, that of Holy Humility, and that of Holy Purity. Volume 7 has been reviewed completely. Sister M. Cristina, currently Vicar of this House, has the 5th and the 6th. Pray the Lord to inspire us on how to do the publication, and do it completely according to His Divine Volition. Amen. My thought is that the first print should be done in Oria, and that afterwards the whole printing should pass to Messina, where I reside, under my own eyes. In the meantime, continue the 15th in black, in which You started to write what happened to You during your infancy, childhood and youth. Write everything. Write also a faithful and complete narration of the illness – that is, your being bedridden; when it was, how it happened, in what year, the oppositions of the Bishops, of the Confessors, etc., etc. Also, in volume 19 write everything – everything that Our Lord reveals, even tiny things in passing. 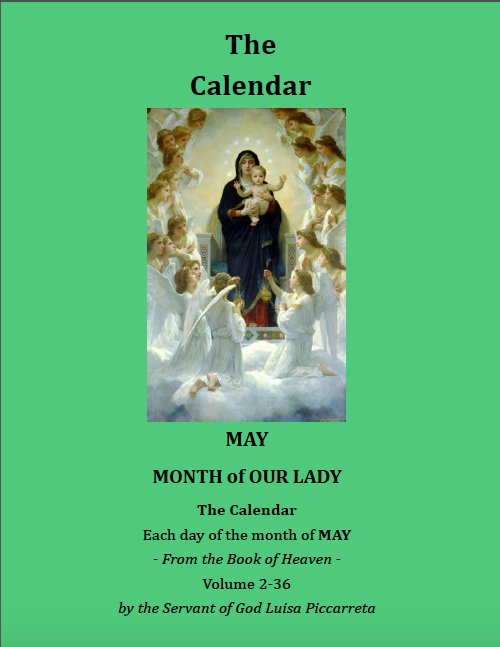 Everything for Holy Obedience, great Lady, for the Glory of God, for your mortification and for the good of souls. Be careful not to distort or hide anything! Most esteemed one in the Lord Jesus, Our Beloved and only Good! Your Lady, which is Holy Obedience, wants you to write everything that you remember of your childhood, infancy and youth as far as the blessed intimate relation with the Divine Lover, adding the beginning of the illness that confines you to bed. 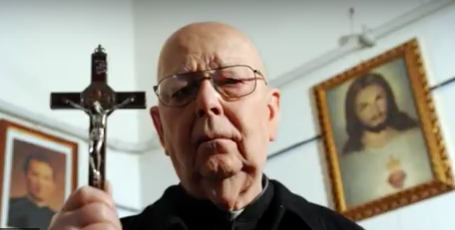 This will be a secret book; you will not show it to anyone – not even to Father Don Benedetto, who is your Confessor, but not your Spiritual Director. If he asks you, you will tell him that I forbid you to show it to anyone until the Lord will want it so. Then I will tell him the reason. Therefore, he should not be disappointed. You must also write how this story began, and this great mortification of needing the priest every day in order to be released from the drowsiness in the morning. This very day I must go to Rome for about fifteen days. Coming back, with the help of the Lord, I will be in Corato. In the meantime, I continue to work on your manuscripts, which I must go through, one by one, taking some notes on which you will then give me explanations. 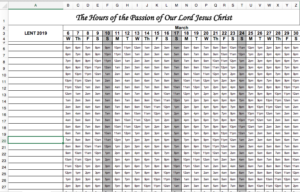 In this way I will be able to better reorder them for the printing, with the help of Blessed Jesus. I am well enough: last night most sweet Jesus gave me excruciating back pain, while I had never suffered from rheumatics in my life. I could not resist; I even felt I was passing out. I offered them in the Divine Will, but I won’t hide from you that I desired to ask the Divine Goodness to mitigate them. Around 5 in the morning they mitigated; I threw myself in bed, and I fell asleep. But how great is the strength that the Lord gave you, to suffer bitter physical pains with great willingness and with desire to suffer more! But your irresistible pain is that of the privation of Jesus, which is infinitely greater than all the material sufferings of the body! 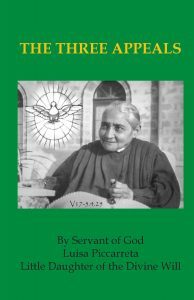 To provide the House of Trani with a Mother Superior, we have in mind an old Sister of ours, of much spirit, of discipline, Founder of one of our Houses, very pious, energetic, smart and capable of presenting herself to the Authorities. Moreover, she knows much about farming, because her family possesses various lands, and also factories, so she will be able to take care of the factory of Corato. Mother General must decide with the 4 Councilors: pray! I won’t tell you, then, how exemplary and solicitous she is for Holy Obedience. Now I bless you with your sister and disciple. Commend me to beloved Lord Jesus and to most sweet Mama; then, the business of Rome, and the trips of going and coming back. Fr. Palma is there, and we have to come back together. I must take the one hundred thousand Lira in Altamura, where I would go upon coming back from Rome. The air of Rome is rather good for me, thank God. 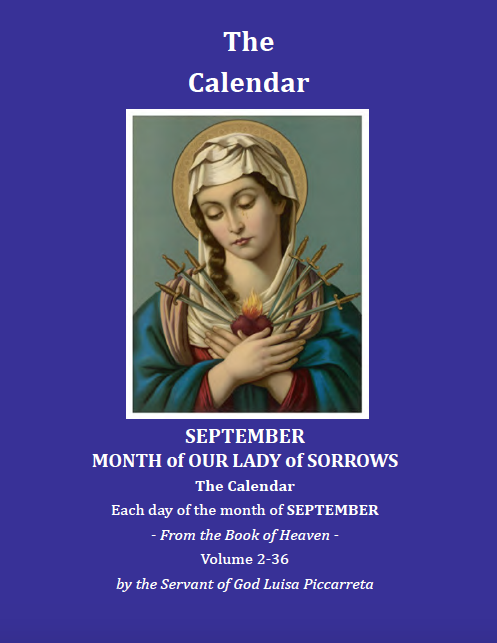 I give you this news: yesterday, first Friday of the month of September, I presented to Our Lord the 3rd Volume, which I finished reviewing completely. Then I went to the Sacristy and I signed it at the end with my Nihil Obstat, with the authority that Msgr. Archbishop of Trani gave me by appointing me Ecclesiastical Censor for the publications of His three Dioceses. So the authorization to publish for the world these books dictated by Our Lord about His Divine Will, is now opened. 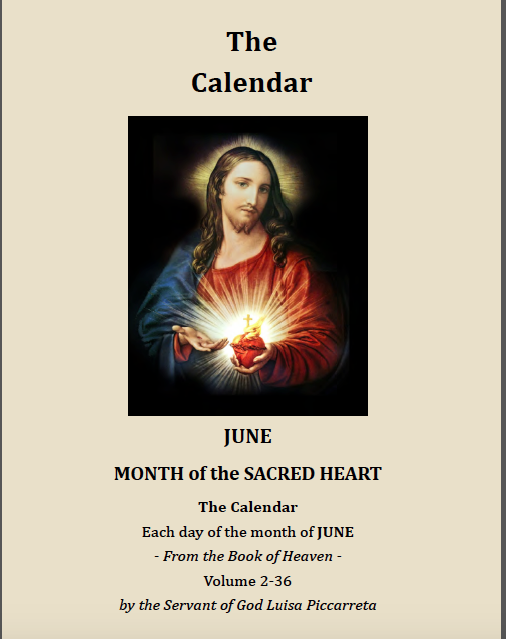 Note that it was the 1st Friday of the month which is dedicated each month to the Most Sacred Heart of Jesus. Now this is my idea: to review, myself personally, with the help of the Lord, all of the other Volumes which I have not yet read – that is, 2nd, 4th, 5th, 6th, 7th, 9th, 10th, 11th, 19th; then, after going through them, to place my Nihil Obstat; and then to pray Msgr. Archbishop of Trani, according to His promise, to place His Imprimatur on each Volume, after my Nihil Obstat. It is understood that I will also place the Nihil Obstat, without new revision, on Volumes 12, 13, 14, 15, 16, 17, 18, which I have already reviewed, and whose originals you have. In this way, everything will be ready for the future – who knows, Our Lord may use whomever He wants. Do you see how, in this way, the celestial plan which wants these writings to be approved by the Ecclesiastical Authority appears to be so well outlined! Who can resist the Divine Will? I think I will come back to Corato between the 21st and the 22nd of this month of September because, in truth, if I can, I will do everything possible with the help of Our Lord in order to present to Msgr. Archbishop of Trani all of our Volumes with my Nihil Obstat on September 24, which is dedicated to the Most Holy Virgin of Mercy, Redemptrix of slaves, and to have all the Imprimaturs, or at least the beginning of the Imprimaturs, on that day, so sacred and meaningful! – which also falls on a Friday. In the meantime, let us pray, because if this point is passed, we can say that the publication is secured. Lady Obedience imposes on you to write, either during the day or at night, everything, everything – everything that the Lord reveals to You: let nothing escape you. This is word of the Uncreated Wisdom, and one word is worth more than the whole Universe. You are not allowed, therefore, to neglect even one syllable. If you are not impeccable in this Obedience, I will ask your Archbishop to exercise greater authority over you. I bless you and your good sister and the young girls. Tell Rosaria (I think that this is her name) to dare no more to touch you and to caress you, as she did once in my presence, otherwise Our Lord will chastise her. 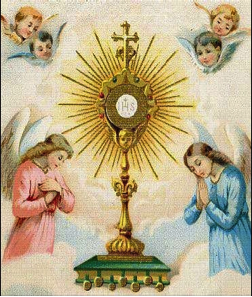 Blessing you again, I commend to you a little bit my poor health, which is worsened by the years; but before all, ask Blessed Jesus for my conversion. If you want, you can write me a few lines. My address is: Via Circonvallazione Appia, 66 – Roma (40). Monsignor Archibishop of Trani has placed His Imprimatur on seven more volumes of your writings. Meanwhile, I have finished reading the 5th and the rest, and the admirable things of the second little volume. Truly the Lord has led you with great, immense goodness and charity. 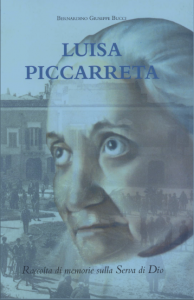 On Saturday, God willing, I will leave for Oria, to begin the printing of the first volume, divided in two parts. In the mean time, commend me to the Lord for a little bit of health, of energy, of serene mind, because without a powerful help from above, I feel I am in the decline of life, and the publication of these admirable writings requires a divine assistance and a time length of years. Who knows what the Lord will do! Pray! Here, one of the two: either the increase of my natural strength, as if I were to go back twenty years, or the supernatural assistance of grace. But we cannot know whether the Lord Jesus wants to use me or others for this complete publication. As far as myself, I feel a great Divine assistance for penetrating into the spirit of these writings and coordinating them for the purposes of the Divine Will. Surely Our Lord can infuse this intellect in whomever He wants, I being unworthy of a Mission so holy! Blessed daughter in J. C., Our Highest Good, His Excellency Msgr. Archbishop of Trani to whom you belong, gave me jurisdiction over you as far as your writings and their publication – that is, to handle you and to dispose the publication as I believe is right (his words). These faculties embrace everything you have written until now, and everything you will write in the future. The same Msgr. Archbishop was so benign as to place so much trust in me on this matter – blessed Jesus disposing it so – that He appointed me, as you know, Ecclesiastical Reviser for the publications of His three Dioceses, and He went to the point of committing himself to placing his authoritative Imprimatur after my Nihil Obstat. And He began to do this without even examining one single volume! From this you can understand well how everything was Will of God, and that regarding the double aspect of yourself in relation to your writings, and of the writings themselves, present and future – you are under my exclusive obedience. Let us not even consider that something similar can be seen in your recent Revelations; but above these, there is the concept of the aforementioned authorities over you and over the writings, given to me by the Ecclesiastical Authority. I said exclusive obedience to myself, because two directions in the same company cannot be admitted, because with the inevitable disappointments which might arise, one could no longer go on. This does not alter the fact that, occasionally, I may take to heart the observations which I may receive from my dearest Fr. Benedetto Calvi, of whom I have admired the great care he has for you and for the precious revelations; and I feel no jealousy that he may read those which are to come even before I do, giving me his opinions, making his observations, and the like. 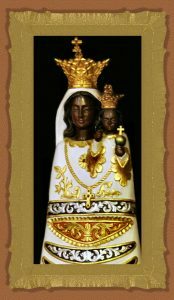 That which is important in the carrying out of this matter, is that you, he and I pray most humbly and fervently to the Highest God, Father of light, the adorable Jesus Christ Our most loving Lord, the Most Holy Virgin Mary, our Saints, Angels, etc. etc., that we may not be mistaken in such a delicate thing, but that a divine light may assist both Writer and interpreters and Compiler, so that in no way may we go out of the boundaries of the Divine Revelation; and that in everything we may be conformed to the divine prudence with which one must receive and deal with similar excelling supernatural Revelations that pass through the human channel, which is not always completely emptied of subjective imperfections – not intentional, but accidental, as the Mystics teach. Therefore, we have great need of praying tirelessly! We cannot take a mission so important lightly and superficially. And we must consider how many times, in these Revelations, Our Lord repeats to you to be attentive to writing faithfully that which He reveals, so that the meaning of what He says may not be altered; and that one different word, one comma more or one less, or out of place, may alter it, even if unintentionally. We must also consider the repeated complaints of Our blessed Lord Jesus Christ, because He commands you to neglect nothing of what He reveals and says to you, be it even the most minute things, and you do not do it exactly. Some time ago, you wrote me that you are afraid of the obediences I may give you. But it is about time that you banish these fears of the love of self, as well as any reluctance or repugnance, when it comes to the Glory of God and the good of souls. Until now you have formed for yourself a formidable idea of Holy Obedience, to the point of comparing it almost to a tyrant. But it is time to change language. Imagine the new Obedience, instead, like a most passionate Mother who has one daughter alone, whom she loves dearly, and all of her commitment is in raising her a saint, in rendering her wholly of Jesus, net for souls in the Holy Church, and most docile instrument in the hands of God. 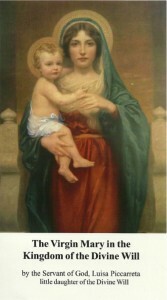 As much as she is tender and passionate in love toward this only daughter, this Mother, who has her origin from the very Heart of Jesus, will yet be strong in using all the appropriate means for the success of her beloved daughter, leading her to the purpose; nor should she let herself be conquered or hindered by the laments, the little tears, or the childlike reluctances of her tender daughter. 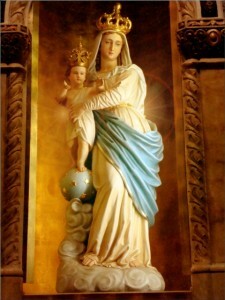 The great Lord of this tender Mother is in regions far away, and He entrusted the little daughter to her, so that this Mother, tender and strong, may raise her for Him to true sanctity, and perfect observance of the commands of the Mother, to the extent of becoming completely submitted to her. And when the Lord comes to verify the happy outcome of the little daughter, and finds her mature in Holy Obedience, and has then exhausted all His designs for the fulfillment of the third Fiat – then, the beloved creature will be delivered to Him once again, and after having espoused her in the consummation of His Divine Will, He will take her with Him to the eternal wedding. 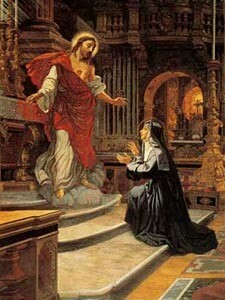 Having considered all this, it is necessary that you, dearest daughter in J. C., do the Holy Obedience, not by force and with pain, but with generous spirit and with holy joy and gaiety, knowing of fulfilling, in this way, the Divine Will, and of cooperating for the Glory of the Most High, for the greater consolation of the Heart of Jesus, and for the good of souls. But let us come to the practice, and to how the adorable Will of God for you is manifesting itself. Only a few days ago, while reading your writings, I fixed my attention on the considerable distances of the dates between one chapter and another. Sometimes you let ten, fifteen days pass between one chapter and the following. Is it possible – I was thinking to myself – that during these long intervals nothing occurred between the soul and Jesus? Do the divine communications cease for such a long time? Is there nothing to relate in these time lapses? Who knows how many things the soul keeps in silence! You will say to me: but it is Jesus that sometimes does not make Himself seen, and does not say anything to me; then, what can I write? You will write of your suffering day by day, even just a few words. But obedience regards especially when Jesus speaks to you – of neglecting not even a comma. I told you of the comparison with precious pearls, and you added that the Lord had compared His words with precious diamonds, none of which must be lost! I believe that one of the reasons for which sometimes Beloved Jesus allows nights to pass without appearing to you or without speaking to you, is precisely that you are a little negligent, intentionally, in writing everything. He wants you more faithful in this. Each word of Our Lord is more than pearl – it is more than diamond! We do not know for what future souls, present in the divine mind, Our Lord says some words, and wants them to be written for the good of those souls! How can you defraud Him? Also, note that you must transcribe exactly, not only His words, but also the infusions of His light, even if He makes you understand things without speaking. I have reason to believe that when you are in the best disposition, and I hope you are already, to execute this obedience exactly, the divine communications will multiply, and each new word – who knows how many souls it will sanctify and save! Who knows how much sooner it will make the third Fiat triumph! Be generous with Jesus also in this, just as you are in suffering, and Jesus will be more generous with you in consoling you. Therefore, dispose yourself not only to do this obedience perfectly, but to do it with joy – at least on the part of the will – and the gladness of the Spirit will not be lacking to you in doing it. 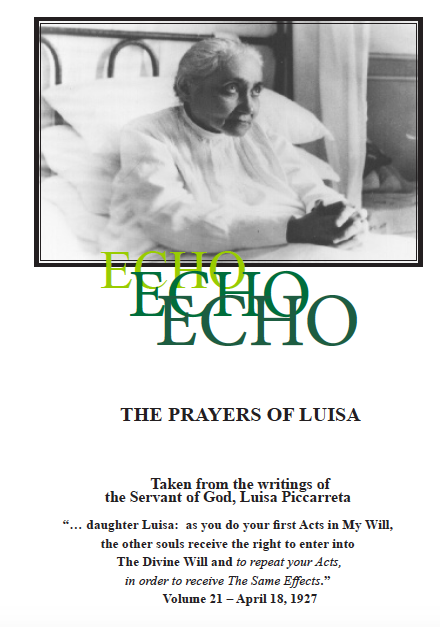 Meanwhile, I also give you the obedience that when you finish writing the 20th volume, you let me know, so that I may take it, place my Nihil Obstat, and have His Excellency Msgr. Leo, Archbishop of Trani, place the Imprimatur. You can let this letter be read freely by Rev. 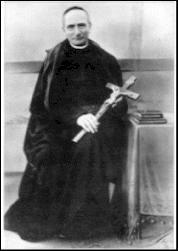 Father Benedetto. Then you will keep it. Meanwhile, let us pray, and you, pray that Our Lord may let you feel all the taste of Holy Obedience done for love of Him, or, anyway, that He may let you execute it generously. You can send the answer to this letter to Messina, at the Orphanage Antoniano. And don’t forget to write on it the word: Personal. So, watch this seriously!…and do not be displeased with this most passionate Mother!…But execute her orders with gladness! Jesus wants it! I received your letter of the 22nd of this expiring month, filled with peace and gentleness. You tell me that in order to correspond exactly to this most passionate Mother, I should be near you, so that you may expose to me the content of the light, and I should assure you about the truth; and then, you would write everything. I believe that this is not necessary, but rather, that it comes from your natural shyness and, a little bit from that discretion which would make you write nothing. Therefore Holy Obedience is this: that after the enlightenment from the Lord, as you come out the union and discourse with Jesus, you do not stay there examining what it is, or what it is not; and even if the thing appears to you a little confused, you begin to write whatever you can, and the virtue of Obedience will be such that Our Lord will enlighten your intellect, or that He Himself will dictate as you begin to write. Sometimes, when you feel the need, as you write to me, to first speak in order to be assured about the truth, and then to write, you can take some notes, and then you will develop them. But the best means is always that of prompt Obedience, because the prompter the Obedience is, the more worthy of merit it is: to write as soon as you enter your natural state. You write me that you felt great sorrow because I took the writings with me. But this was necessary – first, because part of them had not yet been read by me – nor are all of them yet; and then, after I read them, I will send my Lay Brother to Trani with the books which are not yet approved with the Imprimatur of His Excellency, in order to have the Imprimatur placed. In this way, a great point will be surpassed – that each Volume receive the Bishop’s approval, without His Excellency even trying to read them. Does this seem to you a little grace from the Lord? Moreover, in each Volume to be published, it is necessary to compare the copy with the original; besides, notice that many other Volumes are still to be copied. Little by little, as each Volume is printed, I will give you back the manuscript. I make you also reflect on the fact that this Treasure may be just as well kept in a Religious Institute, as in your home. Jesus wanted the writings to come temporarily to Messina, and He will keep them. 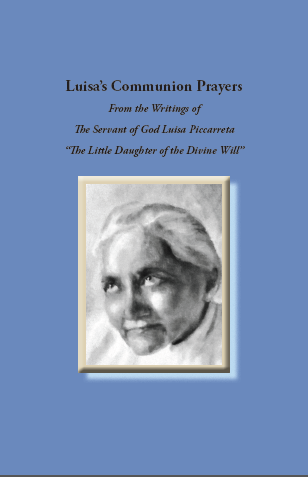 I had the memories of your childhood copied by Sister Mary of the Eucharist, who is writing this letter. Then I compared the copy with the original, and I had to modify a few little points so that the meaning might be better understood. This, on the copy. I am sending you your original with the obedience that, when you remember anything else, you write it immediately. The printing cannot be done in Messina; it will have to be done in Oria, and I am hoping to send tomorrow the first little work to be printed. Meanwhile, I am writing a Preface – a little long, but it doesn’t matter. 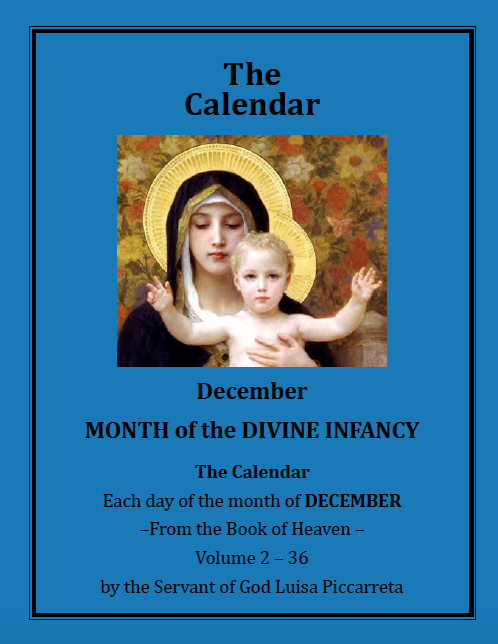 But since Our Adorable Lord insists, so that the writings – that is, the great teachings about the Divine Will – come soon to the light, I will divide each Volume in two parts: the first part will contain the teaching about virtues and the like; the second part will enter into the topic of the Divine Will. This, until we get to the Volumes which talk exclusively about the Divine Will. Then, each Volume will deal with this great topic. You say that at the beginning of Volume 20 there is something regarding me. Well, do not delay – transcribe it for me, that I may regulate myself according to the Adorable Divine Volition. There you have Reverend Father Don Benedetto Calvi, your Confessor, with whom you can also open up, to be encouraged to write everything, because he too is of my same opinion on this matter. So, there are the three of us to press you: Our Lord, the Director given to you by His Excellency for this publication, and your ordinary Confessor. 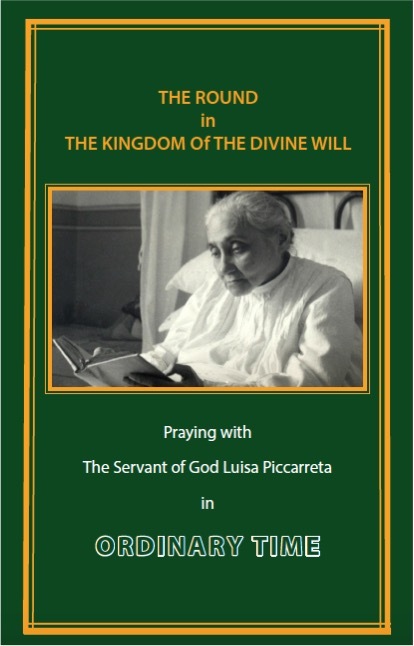 You will have no way out from the dominion of this passionate Mother, which is Holy Obedience. Therefore, resign yourself, and write everything. I had to leave Oria in a hurry, because of urgent affairs that called me to Messina. As far as my health, it is ups and downs, but I feel a special help when I deal with the things of this publication. Unworthily, I do not cease to pray Adorable Jesus for you – and with true fervor, especially that He may assist you and console you in your painful privations! I want to let you know, for the tranquillity of your conscience, that the Obedience to write everything is not under penalty of grave sin, but only for the greater satisfaction of Adorable Jesus, for His glory, for your sanctification, and for the good of souls. But if you neglect completely to write, then the sin would be grave. As far as the copies of several other Volumes still to be made, do not think that this is a matter of a short time. Don’t worry that the intimate writings may go into someone else’s hands. They will go when the Work will be published. You can let your Confessor, Don Benedetto Calvi, read my letters, to whom you will say that I am not your director, at least not as far as the publication of the writings. I bless you in the Lord. I would hope to complete the whole printing in at least five years, and with a cost of one million – maybe more. Meanwhile, I am 75 years old. Commend me to the Lord, because in addition to these writings, I have to take care of other indispensable things as if I were a young man of 40 years. Many obsequies to Reverend Father Calvi. I believe that father Palma has come to Corato. I am in possession of a letter of yours, dated the12th of the current month. Do not torture yourself too much if a few things escape you and you cannot remember them, as you wrote me, when they are little things. It is enough that you pray blessed Jesus to make you remember them, if He wants, and that you make even just a small effort to remember them. For example, you take the book and the pen in order to write, and if the memory comes, fine, if not, let it go and remain at peace. As far as my health, thank the Lord, I can content myself. I am finishing the 11th Volume, which is all filled with Divine Will. With this, I complete the reading of those seven Volumes which still do not have the Imprimatur. As soon as they are ready, I will place my Nihil Obstat on them, and I will send my Lay Brother to Trani to Msgr. Archbishop, so that He may place His Imprimatur. In this way, this very important issue of obtaining the ecclesiastical approval for any event in the future, will be taken care of. It will be a point surpassed for which we must thank Our Lord with immense gratitude. I wrote two letters to Fr. Palma, that he may go to Corato and meet the lord Mayor there. 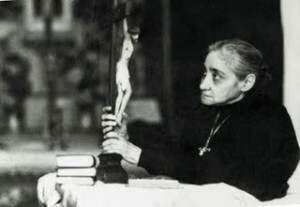 I hope that he will do it, or has done it, together with the new Mother Superior, Sister Mary Paraclete, who is really a chosen soul, because of her piety, intelligence, prudence, and who, together with a brother of hers, a Priest and Vicar forane, a man of holy life, now deceased, has been the founder of one of our Orphanages in her home town in the province of Messina. I thank you for the words you have copied for me regarding the Divine task which Our Lord, in His infinite Goodness, deigned to give to miserable me and to my people, of publishing the marvels of His Divine Will. In this way Our Lord shows that everything is His work. The printing has already begun – precisely, that of your childhood. I am preparing a preface for the whole work. I could not obtain that the printing would begin at the Press of my Institute in Messina, because they have many works there; so it started at the Press of Oria, in which I have many of our young typographers who, quickly and with great love, have appreciated very much the privilege conceded to them by Our Lord to publish these writings. They are directed by an excellent young Brother of ours, who is also studying for the Priesthood. 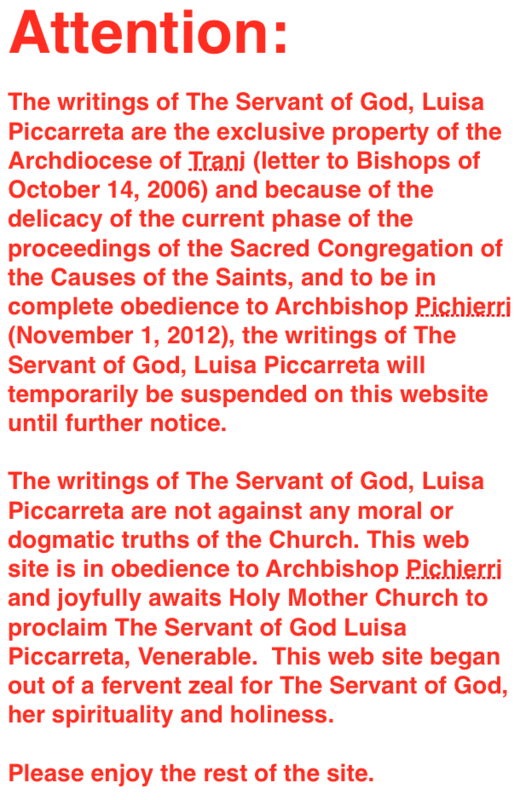 His name is Brother Tarcisio of the Most Holy Sacrament. I also sent him the copy of the 1st Volume, so that he may begin to print it. I am having a most pious Salesian Sister of St. Francis de Sales, fairly well educated but wholly of the Lord, copy the 2nd Volume with a very particular system, so that I may make the necessary corrections at the margin, because sometimes the way you express yourself is not clear, in addition to the very many errors of orthography and the many pages with faded ink. Sometimes I have to add a few notes of clarification, according to the lights which the Lord deigns to give me. However, I desire to let you know, for your tranquillity, that in all of these publications, as long as you are in this life – and let us hope that Our Lord may let you be for very many years – your name will not appear at all, except as “the Author of the Hours of the Passion” and of “Solitary soul” – and not even the home town. I am also convinced that until the printing of each book from the copy is complete, I still need the original for the necessary comparisons. But also on this, we must be peaceful in the Lord, because Our Lord will know how to keep well these precious writings. Each volume I complete as far as copying and printing, I will send back to you in its original. As I keep reading, I take a few notes about observations which I hope to discuss with you personally. Meanwhile, may my meager prayers and yours, more worthy, run in the immensity of the Divine Will of the Most Holy Humanity of Jesus Christ and of His Divinity, with which He operated in the Will of His Divine Father, so that Our Lord, by the intercession of His Most Holy Mother, of His Angels and of His Saints, may want to give you and me the grace to fulfill this Work of Heaven. So the outcome will have its perfect fulfillment, in one way or another, or in a way which we don’t know yet. From your chapters, I learn of your ineffable and continuous pains because of the privations of Beloved Jesus. This moves me very much, and pushes me to pray Jesus to interrupt these terrible privations and to console you with His Divine Presence, more often and more at length. There are also points in your writings in which the patience and the kindness of Our Lord toward you appear in an admirable way. Then, I suspend the reading to recite quite a few Glory Be’s of thanksgiving to Our Lord for His great kindness toward you. I have nothing else to add for the moment; I only ask you to give my regards to Reverend Fr. Don Benedetto. With many blessings upon you I finish this letter, to which I do not require an answer if there is nothing special to tell me, so that you may not tire yourself. Finished on November 23, 1926. The writer of this letter dictated by Rev. 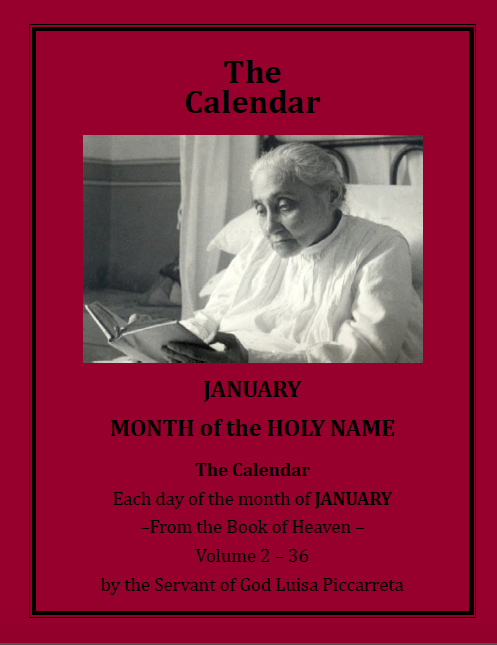 Father, Sister M. Gesuele of the Most Holy Redeemer, implores your prayers and will keep the secret! P.S. The publication of the entire work, with the printing, will be of about 25 thousand copies. And since the work will be fairly thick, because it is the Divine Word that speaks, and this is substantial Word of the Eternal Father, you can understand well how great the expense will have to be. But the Great Divine Treasurer certainly does not lack the means, even if it should cost a million. Besides, the books will be sold quickly, maybe more than the Hours of the Passion, and the money spent will return, and maybe even more. I received, some time ago, your letter of good wishes for the holy Feasts of Christmas, and I return them to you wholeheartedly. 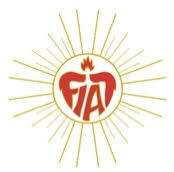 May the triumph of the Fiat grow ever more in you, with all Its eternal Light, and may It spread throughout the whole world. I am letting you know that my young typographers sent me 40 proofs from Oria, which I have already corrected, and which I have to send back. 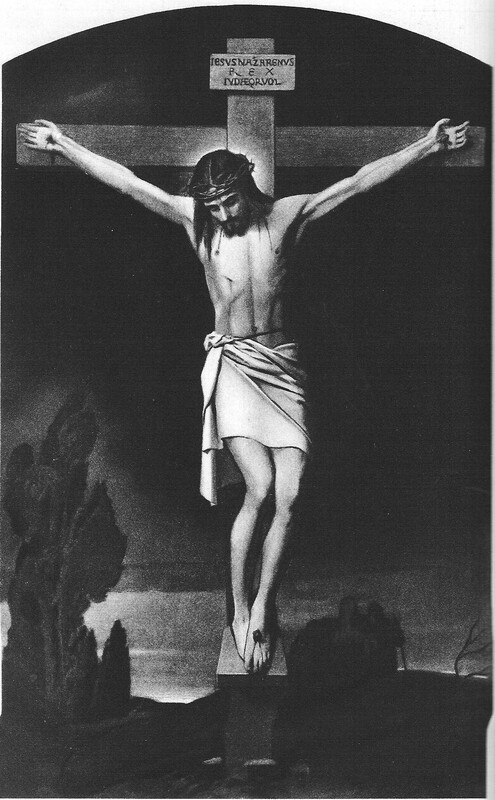 To date, the printing has reached that point when Our Lord, for the first time, drove the crown of thorns into you with His own hands. There is a line in that first Volume, which says: “The new life which began at the Farm called Torre Disperata [Desperate Tower]”. I would like to know whether this is the name of the Farm, and why it is called this, and whether it might be appropriate to remove this name. Now I want to tell you what my thought is regarding the order of the printing. 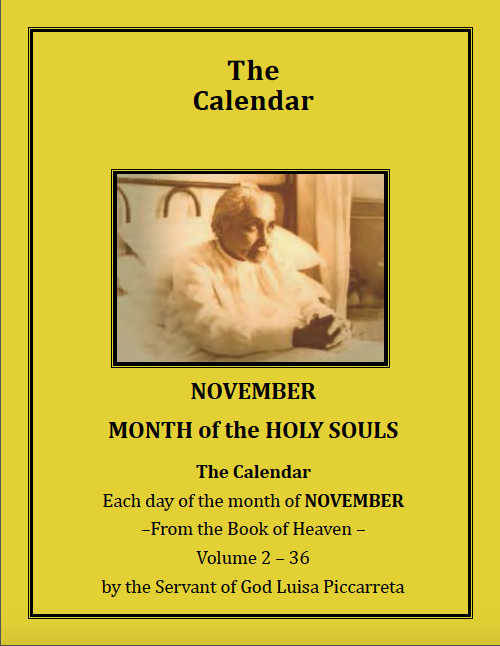 On one hand, it seems to me that we must publish the chapters which deal with the Divine Will as soon as possible, because, according to what you have written to me, Our Lord yearns that everything that regards His Divine Will be published as soon as possible. On the other hand, we can say that more than half of what you have written until now, are chapters which regard other very important Doctrines which we must not neglect – as for example, the teachings about Virtues, the sublime manifestations of Divine Love, and also the chapters which deal with the Divine Chastisements that, in the future, will serve two purposes. First, as proof of the Writings, that is, of the Divine Revelations, since there are events predicted in the chapters, which have subsequently come true. Another purpose is that, both now and in the future, men may comprehend that Our Lord is forced to send chastisements when the peoples do not walk straight – and this, to His greatest sorrow, and for the salvation of souls. Now, wanting on one hand to publish what regards the Divine Will as soon as possible, and not wanting to neglect all the rest – that is, Divine Love, Virtues, Chastisements – I thought of dividing each volume to be printed into two parts, publishing in the first one, gradually, according to the manuscripts, all that regards these three categories – Love, Virtues and Chastisements; and in the second half the chapters which regard the Divine Will. It is understood that sometimes, in the chapters about Chastisements, about Love or about Virtues, one may find sections which imply the Divine Will – for example, in one chapter about Divine Love there might be also a Revelation about the Divine Will. In this case, I would proceed in this way: if the chapter abounds more in Divine Love, it will then take its place in the printing of the first part; if it abounds more in Divine Will, it will take its place in the second part. For this purpose, I desire that you obtain enlightenment for me from our Adorable Lord Jesus Christ – not through Revelation, but through the way of Faith – that I may comprehend well whether this thought of mine is in conformity with the Adorable Will of Our Lord – and give me also your opinion. I hope that each Volume will be of 600 pages, like the Hours of the Passion; but with pages larger by half. 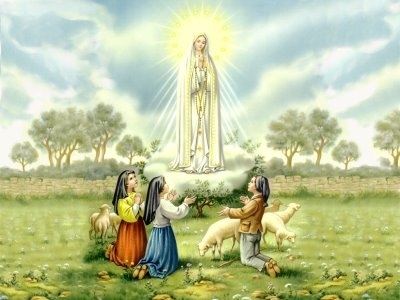 In the Spring, if Our Lord Jesus kindly gives me life and health, I will withdraw to Oria for at least the whole Summer and part of the Fall; in this way the printing will run more rapidly. You will receive some ink for the fountain pen. It is good, but we were not able to find those little bottles “Insuperabile” in Messina. Give us the address of the city and the factory where it comes from, and we will write them. Convey my most happy wishes to New Father Calvi, that good Jesus may want to fulfill all of his holy apostolic desires, and make him, more and more, Apostle of Faith and of Zeal. May he forgive me if I do not write to him directly, because I am very busy. Many wishes also to the good sisters Cimadomo. Our Lord will certainly give them a great recompense for the pious donation they made of that land, for the purpose of having a House of salvation for many souls built on it. 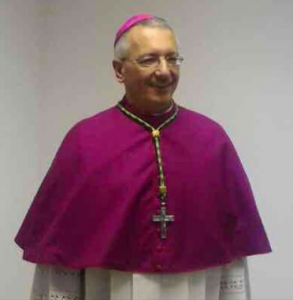 Currently we have here the Vicar General of the Diocese of Messina – a young man of gold, extremely well educated, good, seriously ill; and it seems that Our Lord wants to take him away from us. The Archbishop and all of us are afflicted because of this possible loss, and I commit you to pray the Divine Spouse effectively, that He may give him to us perfectly healed, if this is in the secrets of His Divine Volition. I bless you along with your good sister Angelina. I received your letter, and I tell you that you still do not have the obedience to leave this world. You will have the obedience in the Divine Will, when the Divine Incarnate Word, most sweet Jesus, has completed His Revelations, which, how much longer will last, we do not know. Let me know whether during this period of your fever the Revelations have continued, or have been suspended; and whether you are writing as usual, or not. As far as your fever goes, take a hot tisane of chamomile flowers for a few nights. If you want, and if it seems appropriate to you, you may also call a doctor. For this, do as Father Calvi tells you. For myself, I let you know that I am not in good health. I feel my strength exhausting, and I spend some nights sleepless. I had to suspend, in the middle of it, the work of the correction of the proofs. I would shock you in telling you how the infernal enemy trampled me in order to destroy me when I was doing this work. For the time being, I had to suspend. 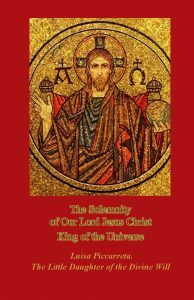 We have started special prayers to the Most Holy Name of Jesus. Without a special help from Our Lord, I will not be able to go on. Pray, but don’t think of leaving us. I bless you. I am dictating this letter from my bed, today, Monday 24th of January, at about 3 O’clock in the afternoon. I bless you again along with your sister. If you need something, make use, freely, of our money which you have with you – relieve your poor sister. Many obsequies to Father Calvi and to the sisters Cimadomo. I answer to your most dear letter. Do not be worried about your manuscripts in the case that the Lord should call me to Himself; in fact, since you are living, they would be delivered to you, or the Lord would destine someone to continue this printing. And if you were in Heaven, together with me, we would converse with Our Lord, beloved Jesus. In any case, it seems to me that we should not worry about this; the manuscripts are kept in a little closet and, in substance, they are neither mine nor yours, nor of anyone, but of Jesus – “Books of Heaven”, as He Himself called them; and He Himself knows what he has to do with them. Currently, they serve for the printing, and they are being copied, although, in order to copy them all, it will take a considerable time. Here, I myself together with the secretary Sister, have corrected the proofs of many pages of the 1st Volume, which had been copied because the original cannot be given to the typographers at all; yet, I can say that it is often necessary to check if the copies are conformed to the originals. You ask for news about my health. I wouldn’t know what to tell you exactly, since I find myself in a state which is quite indefinable. The doctors say that, physically, there is nothing serious, and that it was an inflammation of the pleura which, little by little, will go away through remedies, but I see almost nothing of a return to my state of health. I must remain more in bed than up; I feel great weakness; the strengths have gone, and if I make some small efforts, even in getting up and in dressing, I become breathless. At night I do not always sleep tranquil. I wake up with some restlessness and hampered breathing. I no longer celebrate Holy Mass, but I receive Holy Communion in bed. The appetite for food, which has always been good in me is now very much reduced. Sometimes, absolute lack of appetite. All this – my physical state of illness. But things do not end here. I have also entered a moral, spiritual state in which I seem to see and to feel the diabolical operations of the infernal enemy. Discouragements and oppressions assail me day and night; I feel interior abandonments and desolations, profound preoccupations within me – in sum, an interior state of such anguish and suffering which I have never before experienced. All the miseries of my life, the responsibilities, my sins, the priestly obligations etc., come before me; and all this with an interior depression. I feel my heart and my soul as though under a press. It seems to me that what you wrote me is coming true – that is, the demons are enraged because they see me involved in this publication; and unable to act on me externally, because I do not walk on those paths, they act interiorly in order to destroy me and, by reflection, destroy also my health. In all this I also seem to see the permission of the Lord, who disposes all this in order to place my soul into an unusual purgation, maybe precisely because of the great Work I must publish. During these assaults, I keep in mind what our Lord teaches in one of the Revelations – that one must not huddle himself within his own will, but should make a jump into the Divine Will, where the weak become strong, the sick healthy, the poor rich, etc. I often make these jumps into the Divine Will, but everything in a state of aridity. A few times, some feeling added. Anyway, days are not always the same, but ups and downs, and in spite of these troubles of mine, I do not neglect to correct the proofs and to send them to Oria with letters in which I explain what to do. In sum, in order to work on this Holy Work, I expect neither recovery nor the liberation of my spiritual state, but a commitment to serve our Lord, since He Himself said, if you remember, that I must not waste time in pushing the publication forward. 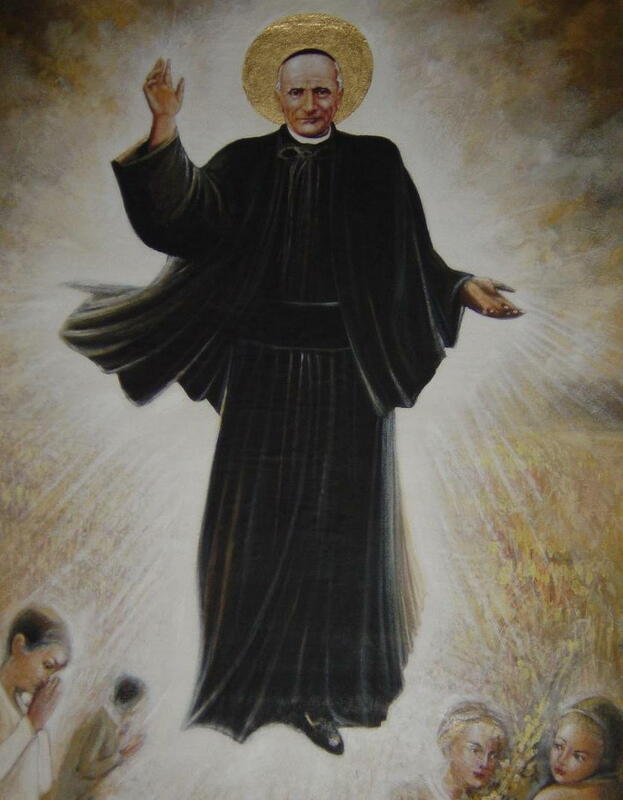 My people are grieving because of my state, but sometimes, joking, I would say that I am in the novitiate, for mine is a training that the Great Divine Master is making me do, to render me suitable for such a great enterprise. Truly, the enterprise is great – first, because of the importance of these Divine Revelations; second, because of the hard work which must be done for the publication, for which I believe our Lord has given me special lights, as you will see from the first printed Volume that will be published, with the help of the Lord, with my going to Oria next Spring, with the help of God. As far as the obedience given to you not to depart from this world without holy obedience itself, know that I said this in a way that is conditional on the adorable Will of our Lord – may He do whatever is best in His sight. For now, keep Volume 20 with you. You tell me that in this 20th Volume there are things for which it seems incredible how much the Highest God has done for us! It is indeed so. I also tell you that in reading the nine Exercises of Christmas, of which we have already prepared the proofs, one remains astounded at the immense Love and the immense suffering of Our blessed Lord Jesus Christ for love of us, and for the salvation of souls. I have never read in any other book on this topic a Revelation so touching and penetrating! For everything, let us give glory to our blessed Lord! And now, I cannot do without commending myself, warmly, to your prayers before our blessed Lord Jesus, for the work, for the strengths, and for tranquillity of spirit and of mind in order to publish – or better, to compile, to reorder and to publish – these most precious writings, according to the enlightenments which I seem to have received by our Lord, that He may want to restrain the infernal legions with His Divine power, so that they may not succeed in destroying me. And for this, also commit the power of the Most Holy Virgin Mary, that She may keep Lucifer and his demons in chains, and may keep me sheltered under her maternal mantle.
. I talk about it with people of spirit; I engage in conversation about this topic with whomever I best can; I promote it as much as I can, also in my Institutes. As soon as possible, with divine help, we will establish the Pious Universal Union for the Children of the Divine Will, with the little chaplet included, about which I wrote you the other time. You wrote me that whenever I write and speak with others about this topic, Adorable Jesus seems to go out of your heart (in which He always remain), in order to come to listen to what we say here in Messina; and He is pleased. 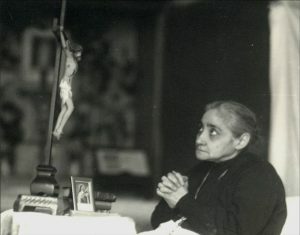 Therefore, in this state, now light, now grave, of interior perturbations and of aridity in which I find myself, help me with your prayers before your beloved Spouse and my most loving Father, Jesus, that He may give me confidence, patience and transformation in His Divine Fiat – in sum, that He may make me do a good novitiate. This enterprise is great not only because of everything I told you, but consider that it is about 25 thousand copies of the whole Work, of all the Volumes, present and future; therefore it is an enterprise of millions of lira. Those dear young men of mine in Oria, the typographers, are working with great affection and great care; and I assure you that the edition presents itself as very beautiful, and I hope to send you a sample soon. From the handwriting of this letter, you will notice that I have a secretary, as I told you the other time, who is Sister M. of the Eucharist, to whom the Lord is giving this great grace of cooperating with me in the compilation and in the revision of the proofs, letters, recordings, keeping of the manuscripts in the little archive, etc… She commends herself very much to your prayers, that she may fulfill her offices well. I keep explaining my thoughts regarding the compilation and publication of this great Work to Can. Vitale, a Priest so very dear to me, and to my young Priests; and since they are very intelligent and of good spirit, they might be my successors in this great work, if the Lord should call me to Himself. And they would proceed with the same method and system which I started. I end here – I have tired you enough. But with whom can I talk about such things? From whom can I hope for an interest of prayers in my current state? P.S. If the Lord inspires you, answer me, even just briefly. Your letter has been of great comfort for me. I feel I have become a nothing before the great Mercy of the Lord, and the great deposit of the Revelations about the Divine Will! Last night, unexpectedly, I had a tranquil sleep, as in the times of my good health, and I was able to celebrate Holy Mass at 6 in the morning. This is why I sent you the second telegram – that you might be tranquil, though you always are, by the grace of the Lord, as the Firstborn Daughter of the Divine Will. Unworthily, I pray for you, that Our Lord may not let you struggle so much in finding Him, and that He may always be near you to comfort you and to sustain you along the hard pilgrimage of life, until He introduces you into His celestial Glory. Yesterday I wrote to Oria for the publication of the Divine Will, whose first sheets are in the course of being printed. Sicut in Coelo et in Terra. Amen. in your Holy and Eternal Divine Will. Amen. I will present this Pious Union, with ecclesiastical approval, to the Sacred Congregation for the Indulgences in Rome, and I hope it will be enriched with holy Indulgences. It will serve to spread the publications and the knowledge of the Revelations about the Divine Will throughout the world. If the Adorable Heart of Jesus will deign to give me back strengths, energy, health, and especially His divine Grace, these Cards will be translated into many languages and spread in many nations. On them, there will be an announcement about the upcoming publication of the Revelations. I don’t know if you remember that in one of your visions you saw Jesus giving a sob of anguish that penetrated Heaven and earth, because of the sins of man. But soon after He sent out a cry of joy, because He saw the Children of His Divine Will appear in the world. Since this Pious Union does not have special forms of regulation, everyone can belong to it, from any status and class – men, women, Religious, lay people, etc. Going back to my poor health, I feel relieved, but still way far away from a complete recovery and from a true restoration of my strengths – and even less, of my mind, which is very disheartened, to the extent that at the mere thought of the great work of all these publications, I feel as though frightened by a mental impotence! Pray to Jesus, that, if He wants, He would make a powerful miracle for my resurrection. As far as taking food, until now I have behaved exactly as you wrote me, but the appetite is not yet coming back. It is a terrible thing to eat without being hungry, and I believe it may even be noxious. Sometimes I abstain from taking any other food between breakfast and lunch – be it even a yolk, waiting for a little appetite to come for lunch time. May the Most Holy and Divine Will be blessed in everything. Every day they make me take a busciarda’ – that is, the juice of a quarter of lean meat. It uplifts me, but it heats my stomach a little bit. They make me injections of iron and other compounds; once a day they give me a spoonful of some medicine, and they say I have to wait for the Spring for a complete recovery, because here, at the moment, the whether is very cold. If the Lord wishes to give me a little health and moral uplift, I will be in Oria for the printing, and then from Oria to Trani, and from Trani to Corato. Right now, because of the state of depression in which I find myself, this seems impossible to me, because among the other things, the exhaustion of strengths gives me breathlessness in the movements of walking, going up the stairs, etc. I am almost always in bed, or seated. I believe I have made you comprehend well enough my physical, moral, spiritual and intellectual state. Let us expect every good from the Adorable Divine Will. I feel the attacks of the infernal enemy trying to destroy me, but I trust in the Omnipotence of the Divine Will, whose great Work the infernal spirits would want to bewilder. The secretary writer thanks you for your good words and commends herself to your prayers. I must commend to you the man who assists me at night. He is one of our lay brothers, named Bro. Salvatore. Since up till now I have spent most of the nights in sleeplessness, moral afflictions, oppressions, apprehensions, etc., he, most patient, has kept vigil beside my bed, reciting for me the chaplet of the Divine Will and other prayers. He has his bed in a room adjacent to mine, but he has not been able to sleep because I have often been forced to call him – and he is ready, immediately. But now I don’t know what our Lord is going to do in the following nights. Pray, then, the Divine Spouse, that He may triumph over my every misery, for the realization of the publications of all that regards His Divine Will, as I trust and hope that He has not condemned me for my sins and my infidelities. Yesterday, in writing to my typographers in Oria, since they had written to me that in order to run more quickly there is the need to buy another good assortment of typographical characters from the factories, I answered that they should buy them. Oh! if I were in the vigor of my strengths and of my mind, how I would wish to fly to Oria to dedicate myself to this divine enterprise! But the Divine Will does not need my meagerness and misery! Pray, then, because it is written in the Holy Books that God does also the will of those who fear Him. Deus faciet voluntatem timentium se! 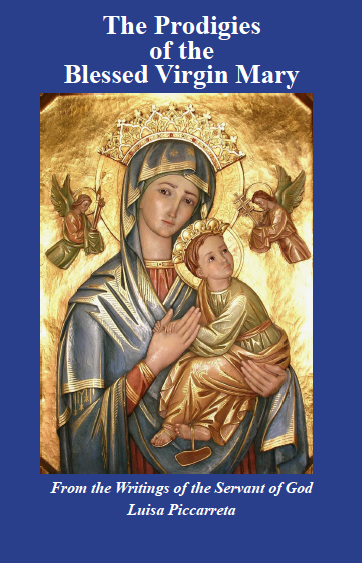 Engage also the powerful intercession of the Mother of God and our Mother, Mary. Currently, your manuscripts are being copied – I mean those which had not yet been copied, that is, the majority of them. A Nun of St. Francis de Sales, retired because of health reasons with the consensus of her Mother Superior, has been in my House of Taormina, near Messina, for several years. 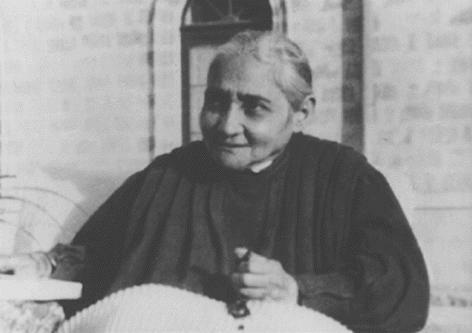 She is the sister of a Bishop, now deceased – an old lady, and a true saint in humility and charity. She is learned and erudite; she also knows French and music – and Italian very well. I entrusted to her the copying of the 2nd and 3rd Volumes, which has already been completed. A few days ago I sent her the 4th Volume. I should review your original Volumes, because, believe me, at various points the sense must be rectified, which you do not always express exactly. I was doing this revision with great love, chapter by chapter, but from the moment I fell into this state, I have not been able to do anything. Yet, this is an indispensable work. There are points which, though true and holy if looked at with the spirit and with holy simplicity, would yet clash with prudence to publish, and one would have to face the criticism of the Ecclesiastical Authority, which would cast a prejudice over the whole Work. There are a few chapters which must be left for when you are in Heaven. Moreover, from the 4th Volume on, the copying must be done in two books, beginning to gather in one, the chapters which deal with Divine Will, and the rest in the other. Now, how can I, in this current state, perform a revision which is all important, when, I assure you, I do not have the strength to read even one chapter, and sometimes, even to hear it being read? I will not say anything else so as not to afflict you. Do whatever the heart prompts you to do with our Highest Good, Jesus, whose operations upon me I consider as punishments for my sins. 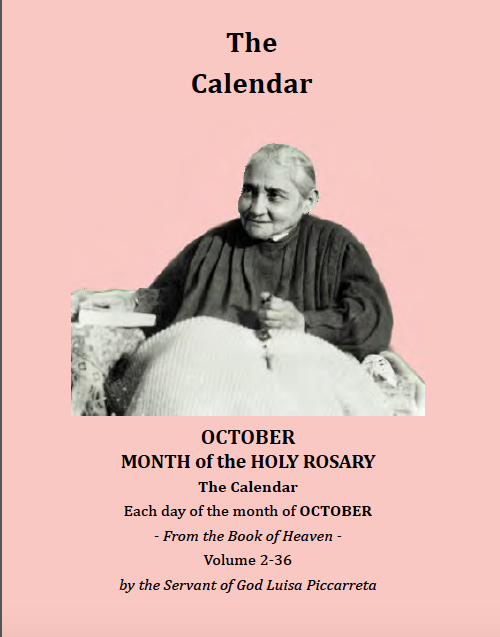 I commend to your prayers that holy Salesian who is doing the copies. Mother Superior thanks you for your prayers; she is doing better. Commend her to Jesus. How are you doing? Last night I had an hour of terrible interior distress, which added to my great difficulty in breathing, and especially because of a trifle, which, maybe, was imaginary – the fear of a physical trouble in my ear. It was a most painful hour – I could find no refuge! The enemy, or I myself, put a thought into me: “Leave this publication – if only you had never started.” I said to the enemy: “No, no, no”, and I blessed Jesus etc. etc. All of a sudden, I don’t know how, I found myself asleep. Your letter of comfort preceded the terrible fight of last night! Comfort me, still, if Jesus inspires you! I have now celebrated Holy Mass, and I am sleepy, but Jesus does not allow that I stay and sleep – the bed throws me out. I am also suffering during the day, but I am a little more calm. No earthly thing, though holy, gives me pleasure! Praised be Jesus and Mary. I bless you along with everyone. Excuse this letter. With physical health I would acquire everything! I received your second letter. The first one I gave to read to Mother Superior also and to some of the Old Sisters, and all of us have remained consoled – also my Priests, because the rumor has spread in our Institutes that the Lord, by His infinite goodness, has destined me to start up to a good point, the publication of the Divine Will, and therefore all of them hope for my healing – and I do too. 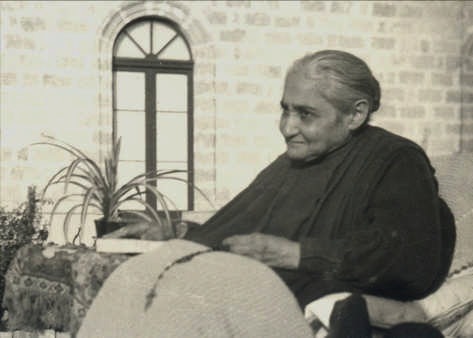 In truth, it seems that the Lord wants it, both because He has placed all of the writings – that is, the great deposit of His Divine Revelations – in our power, and also because of the special enlightenment that the Lord has given me on how to regulate the publication, which you will see rather soon in the first booklet that is being printed in Oria; and also because of the great means and equipment that are necessary, as well as labor – and of all this, the Lord has given us, and gives us, a unique abundance. If these works were to be published in an external press, it would be an expense of hundreds of thousands of lira – and it would even reach the million. Another sign is the terrible war that the devil has been waging against me in order to destroy me – by divine permission, so that I myself may begin the practice of the Divine Will. Only my sins would make me fear that the Lord would withdraw such infinite Mercy from us. Now, for this, I commend myself to your fervent prayers. I spent last night awfully, but today, from 3pm on, I got up from my rest almost like in the days of my good health, and I feel as if I were on the way to recovery. In my afflictions, I have kept in mind that everything is the love of Jesus that operates. Your advice and suggestions are most dear to me, but I am still a baby in this great Science of the Divine Will. I thank you very much for your holy encouragements. As far as the Pious Universal Union of the Children of the Divine Will, I have not conceived it in the way you understood, that is, with many houses that should be formed in the world of Sisters dedicated as Daughters of the Divine Will. In this way the Institution would not be universal, nor could it develop rapidly. In the way I conceived it, all Religious Houses of men and women, and all lay categories, and any person in the entire world, can become son or daughter of the Divine Will, by simply accepting the Card, and reciting every day, with no obligation of conscience, 5 decades of the ejaculatory prayer: “Fiat, Domine, Voluntas Tua – Sicut in Coelo et in Terra. 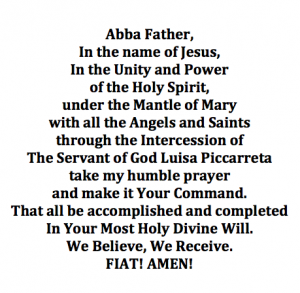 Amen”, alternating with the Glory Be, and with the premise of a Pater, Ave and Gloria. There will not be registers for memberships, nor regulations, but impetrators – men and women, to spread the Cards. , it is understood that our Sisters and all of the internal and external personnel will be Children of the Divine Will. Our Msgr. Archbishop prays, and has made others pray, for the healing of my miserable self; and he wants me to pray the Adorable Heart of Jesus to heal me, though always submitted to the Divine Volition. However, he ignores the sublime Mission of the Divine Will that was given to us, and for now I will not let him know, nor is it necessary. This Mother Superior thanks you for your gentle manners. P.S. I must add that I suffer gravely of breathlessness if I make movements. The origin of it – a pleurisy which the doctors have discovered recently in me; because three years ago, in Rome, I has a bronchial pneumonia, a sort of Spanish fever. I recovered, but I incubated the pleurisy. However, the doctors give assurance of a sure recovery, yet not this Winter, but in the Spring (let us hope in Jesus). I suffer most anguishing nights; and you, who spend the nights with Jesus, remember me, who spend them in agony. The doctors are not concerned at all about my sufferings; they say that it is the nervous system that is altered. But I feel I am dying. I answer to your letter. The proofs are being reviewed by my people. As far as the writings, don’t worry. If I should pass away, my Priests have received from me all the lights that the Lord has given me, and they will continue the work. I apologize to dear Father Calvi, but we are already a Religious Order approved by the Holy Church, and therefore we can give greater guarantee than a simple individual. And then, how could Fr. Calvi manage to improvise press, labor, means, etc. etc. etc.? Therefore, let us follow the Divine Will. You will receive the first prints as soon as possible – hopefully this month. I bless you, and, at night, pray Jesus for me. I see everything closed – Jesus, the Most Holy Virgin, the Saints, etc. etc. I bless you again, and please distribute my usual regards. But my letters for you are secret, except for that which you must relate, and which it is good to manifest. A first section of the first volume will come out as soon as possible, with the stamps of Oria; and you will still remain incognito. However, a Preface is indispensable. I have it in my mind, and if I could dictate it, it would be as it should be in order to call attention to the whole Work and to its great interest. But I cannot dictate it because my exhaustion is grave! Jesus has struck me, and has not yet made me rise again. How should it be done? What do you suggest? Could I but, at least, have a couple of days free! Also the Pious Universal Union of the Children of the Divine Will lies interrupted. I have become impotent to everything. My Houses are praying day and night; the innocent children are praying, but it is as if Heaven was closed! Up to this moment, I have not received any other letter from you. I bless you along with everyone. I leave you, because my eyes and my mind are losing lucidity! The rest of my days has become a mystery! The doctors give assurance of my recovery as soon as I am able to go to the countryside, after Holy Easter or so. P.S. Our most Reverend Father the Founder feels faint, somewhat suddenly, because of lack of breath and lack of sleep. He can stay neither in bed, nor up, nor seated. He suffers very much, poor one – he arouses pity. We are very sorrowful and concerned. We have prayed very much, and we still continue to pray. 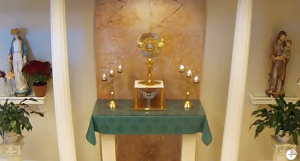 Yesterday We started a very effective Novena to that Most Sacred Heart of Jesus, in a bronze statue, placed over the little closet in which all the manuscripts of the Divine Will are locked. It was placed there as a sure protection for the sublime manuscripts. 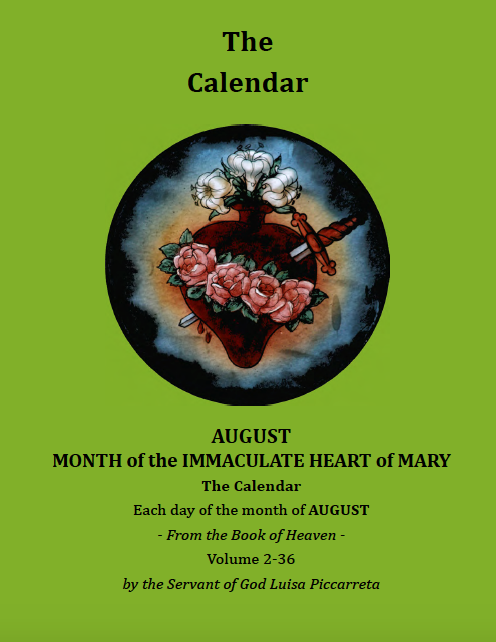 I pray You also to accompany this Novena with your fervent prayers, so that the Most Sacred Heart of Jesus, without looking at our – and especially my unworthiness, may deign to answer us and to grant to our Father, if not a perfect, at least a satisfactory recovery. I address You also on the part of Most Rev. 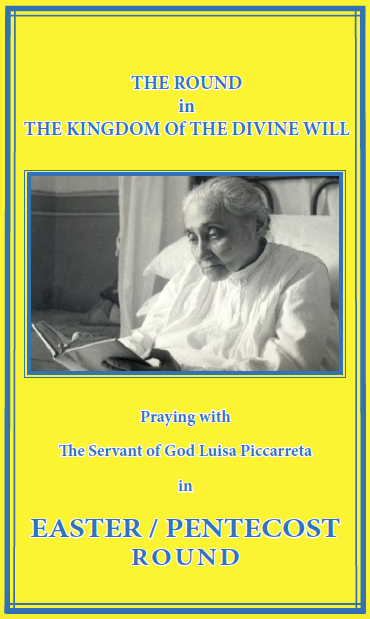 Mother General, who desires that, for pity’s sake, You pray sweet and dear Jesus very much for the recovery of Father. Everything, however, always in His Divine Will. Pray for Rev. Father. Listen, Luisa, is there any danger to the life of Father? If you know something, tell us, for pity’s sake. Most affectionate in J. C.
My days and my nights continue always in the same way – oppressions of sleepiness without being able to sleep, because, when I used to have good appetite, I was used to nourishing myself with solid foods, while now I am almost always having a liquid diet. Now they want me to go back to a solid diet, but the efforts I have to make are unheard-of! Any food is so repugnant to me that I cannot conquer myself; yet I have to conquer myself if I want to get a little bit of sleep. Every day I get up from bed for a few hours, but I remain seated like one who is distraught. I have not washed my face for three months, because I don’t have the strength to do it. The slightest effort makes me breathless, and I feel lost. One of the greatest torments at night is that of not being able to breathe well. In the middle of so many troubles, day and night, I don’t know how I can resist – there is certainly an extraordinary grace. Good-bye to the work on the Publication of the printing; good-bye to the Pious Universal Union for the Children of the Divine Will! The doctors assure that my organism is healthy – perfect the pulse, the heart, the kidneys, the stomach. They only noticed that at one point, under my shoulder blade, the pleura adheres to the lung. They assure that that this inconvenience is superable; that many have had it and are now well. I don’t know what to say; it seems to me that I am getting worse, each day more than the other. With Our Lord everything is silent; the same with the Most Holy Virgin, with the Angels and with the Saints. On the night of St. Joseph, this great Saint dissolved all of my troubles in one instant, and he made me sleep for 8 hours, tranquil, with a little interval. The following day, everything went back as usual, or worse. I no longer review the proofs of the first printing, but my people do. And the Preface? Alas! I no longer have the mind to be able to dictate it! 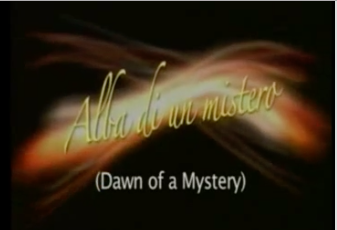 Mysteries of God, in which I find myself enwrapped without seeing the light! Yet, if I am able to dictate it, the Preface will come out so simple and effective as to impress even the highest personalities of the Holy Church, including the Highest Pontiff. I won’t tell you how I feel the demon rage – or rather, many demons; this is why I often make exorcisms against Satan in the Name of Jesus. because of which I was taken by a palpitation that was about to kill me – but then I discovered the deception. 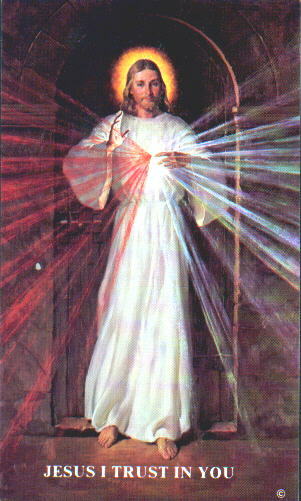 I sent you a beautiful picture of the Heart of Jesus, which keeps in custody the Archive of His Divine Revelations about His Divine Will. If I told you how it happened, you would say that the Archive was made by Jesus. I let you know in advance that in the Preface you will not be mentioned, nor involved. Be tranquil. I return to that offer you made of sharing my night pains with me. I don’t know what to tell you; I would not want them to weigh upon your troubles. Rather, try to obtain a few tranquil nights from the Highest Good, Jesus, if this is in His Divine Will – and also the help of your prayers. For the rest, always thank the Divine Love of the Heart of Jesus that makes me worthy of suffering and gives me many helps. Do not forget about me, especially at night, and when I fight with terrible violence in order to swallow the food – even at night! During these painful nights, this cry often escapes my mouth: “I am dying, I am dying, I am dying”. My assistants, who alternate with each other, comfort me as best they can. Someone else assists me for the whole day. I will not continue further – my head is not holding too well. As far as the issues of the Work, I have not done anything for quite some time. Everything weighs upon Can. Vitale, Fr. Palma, my Priests and the Sisters. 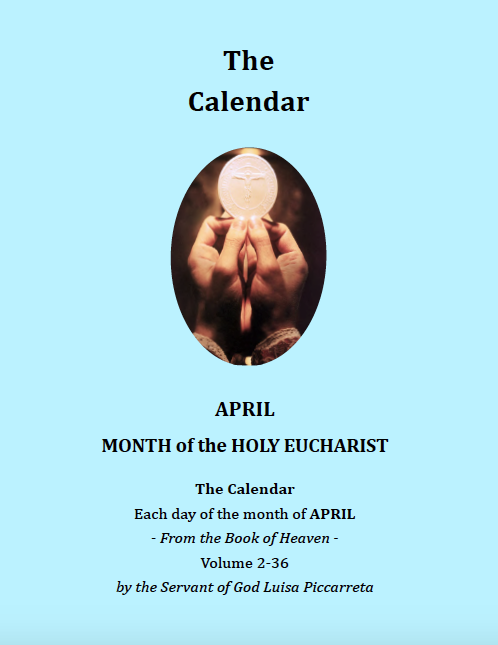 Father Di Francia M. A.
I share with you, in perfect resignation to the Adorable Divine Will, that on the night before Holy Easter my attempt to celebrate Holy Mass failed completely. Even more, I am convinced that, in my current state, I cannot even speak about celebrating Holy Mass. I thank Our Lord for I receive Holy Communion in bed without fasting. After that failed attempt, I spent the day of Holy Easter quite badly, in bed, because of some trouble with my stomach. Then, by Divine Mercy, I fell asleep. On that day, for the first time, a certain taste arose for eating a few little meatballs. On the whole, as far as my health, I struggle on. I must add that, to my surprise, my breathing kept improving from that same night. Things have reached this point. The enemy seems to want to take advantage in order to upset me with his suggestions. When we had Melanie with us, this chosen creature had the gift of miracles and she performed several healings. You confided to me that Jesus offered you the gift of miracles and you refused it. Well then, ask Our Lord, with faith and love, at least to be able to perform my miraculous healing. If you truly ask this of Jesus, He will not deny it to you. I ask you this for the sake of the 19 Volumes which are locked in that Archive of which I sent you the pictures, and for those which are now in process. Oh! how I would immediately get down to work, helped by the Secretary whom you love! In my mind there is the whole plan and carrying out of the grandiose Publication. Oh! how Hell would be defeated! Courage, then, Jesus will not deny you the prodigy. At this moment here in Messina there are lightnings and thunders and pouring rain; the sky is all darkened. I believe this is the infernal enemy who fears that you may obtain this miracle. I will not add anything else. 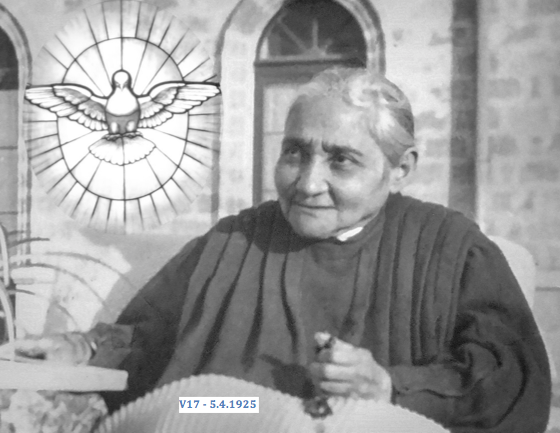 I return to you many good wishes on the part of this Mother Superior General and the Secretary, for you and for yours. My most fervent wishes for you and for Rev. Father Calvi, and may Jesus grant you the miracle as soon as possible. I give you all the blessings I can give. I beg you, do not forget me, especially at night and when I take food. 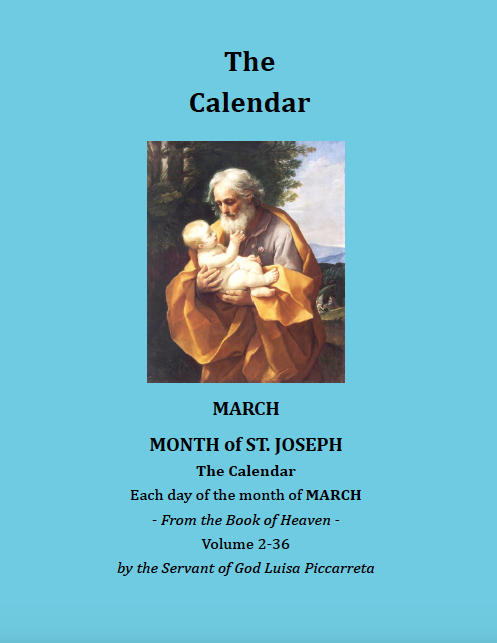 You should see how much Saint Joseph is committed in this work, and how he laughs in looking at the Archive! All of my troubles start from one point: great lack of breath, day and night. This lack, then, comes from the pleurisy, which affected my left lung. If it wasn’t for this, I would recover in a few days. The doctors cannot cure this trouble. This is why I prayed you to ask for a miracle from Our Lord. Once you made one by resurrecting a young man who had been murdered. If Jesus wants, let Him give you the power to heal me, and I will soon come to visit you in Corato. Remember what is written in the Psalms: “God does the will of those who fear Him”. As for me, I am reduced to extremes. The letter you sent me arrived a few hours after I had written to Jesus, and I took it as an answer. It comforted me immensely, but it was the prelude of new troubles. However, your speaking is holy, just and perfect. Only, it would be good for me (I say it in my ignorance) if you were more resolute, in a saintly way, with Our Lord. Forgive me, and I bless you as usual. Last night I slept little and I suffered much with the breathing. But, maybe, the worst is to come. I abandon myself in Jesus, in whose hands one cannot perish.